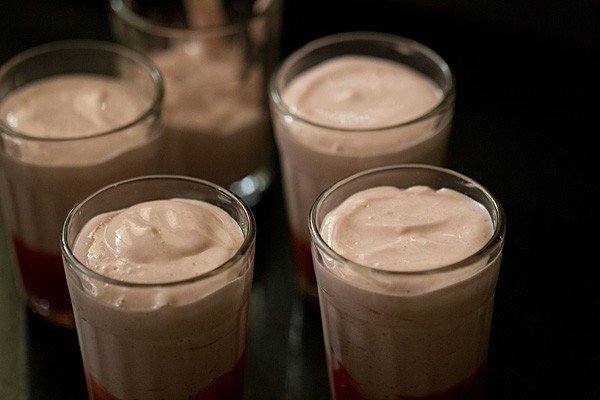 no cook and quick strawberry mousse made with just three ingredients. strawberry mousse recipe with step by step photos – a quick and tasty eggless dessert recipe of strawberry mousse. strawberries in season and i make quite a number of recipes with them. this mousse along with strawberry panna cotta is our favorite dessert. again i made this quick no cook mousse and skipped making panna cotta this time. serve this eggless strawberry mousse as a dessert after meals or you can have it anytime. its so good. the recipe can be doubled too. if you are looking for similar recipes then do check strawberry cream cake, strawberry milkshake, eggless chocolate cake, strawberry cream and eggless vanilla cake recipe. 4 tablespoon sugar or add as required. rinse, hull and chop the strawberries. add them to a blender or grinder along with sugar. blend to a smooth puree without any strawberry chunks. 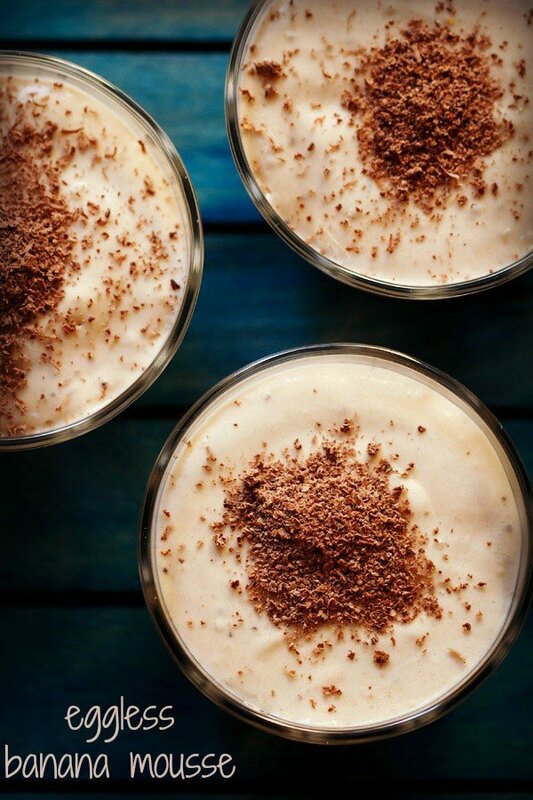 pour 1 tbsp of the puree in shot glasses or bowls. add chilled cream to the puree in the blender. 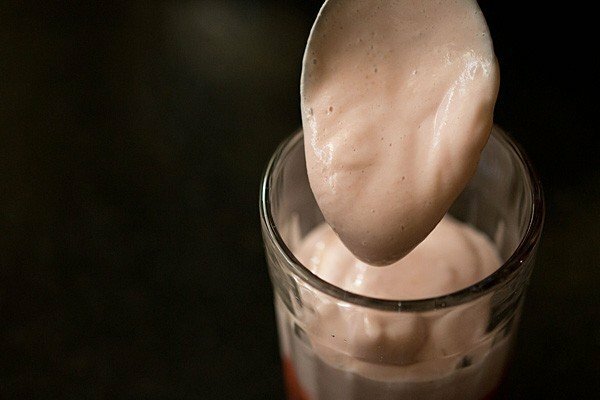 pulse 5 to 7 times till the cream is well blended with the strawberry puree. spoon the mousse in the shot glasses or bowls. cover and refrigerate for 4 to 5 hours or till well set. 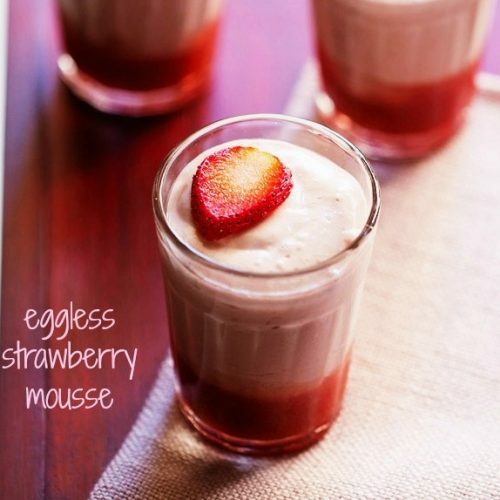 serve the eggless strawberry mousse chilled and garnished with strawberry slices or grated chocolate. 1. rinse, hull and chop 250 grams strawberries or about 9 ounces. add them to a blender or grinder along with sugar. i added about 4 tbsp of sugar. 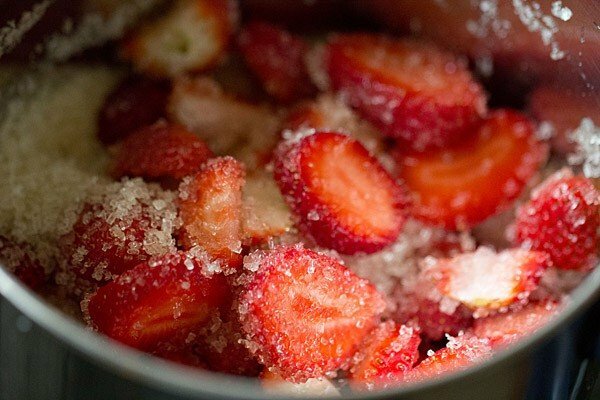 but the amount of sugar to be added depends upon the sweetness of the strawberries. so add accordingly. 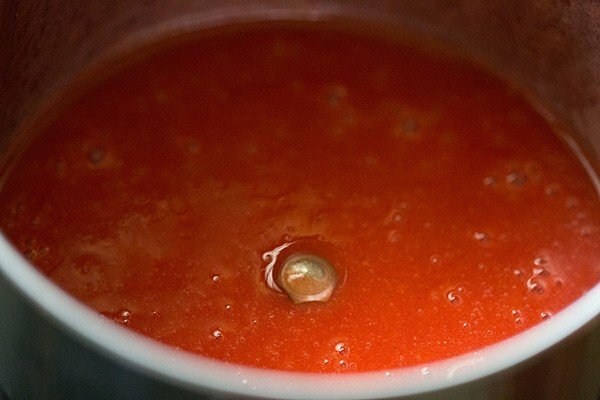 2. blend to a smooth puree without any strawberry chunks. 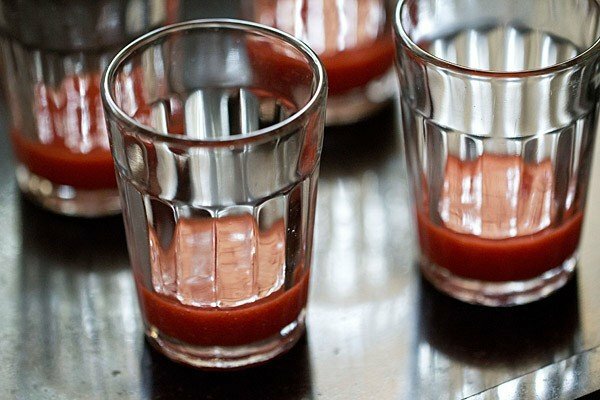 3. pour 1 tbsp of the puree in shot glasses or bowls. i added the puree in 4 glasses. 4. add chilled cream to the puree in the blender. here i used 25% fat cream. you could use from 25% to 35% or even 50% fat cream. 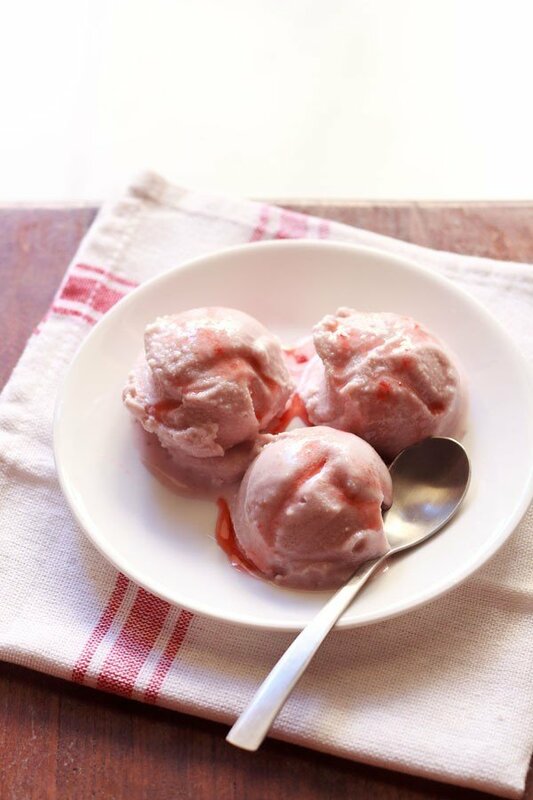 5. pulse 5 to 7 times till the cream is well blended with the strawberry puree. after you pulse once or twice, do check the taste and add more sugar if needed. then continue to pulse again. 6. spoon the mousse in the shot glasses or bowls. 7. cover and refrigerate for 4 to 5 hours or till well set. 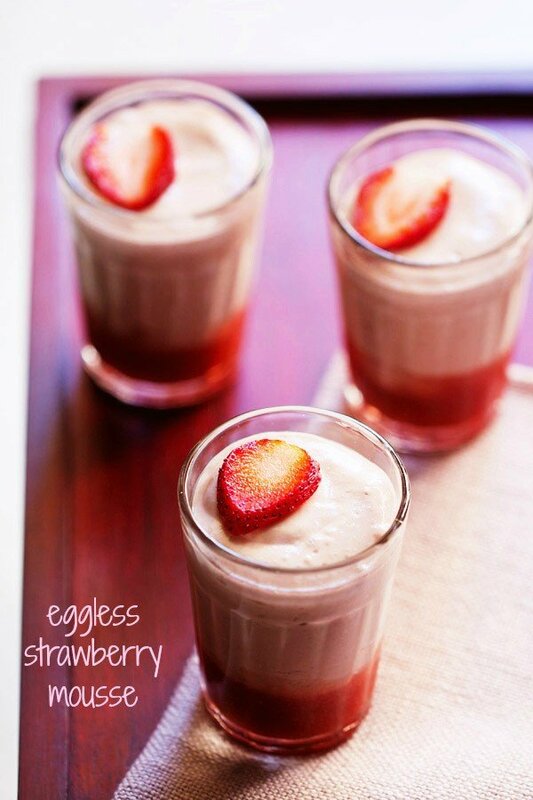 8. serve the eggless strawberry mousse chilled and garnished with strawberry slices or grated chocolate. 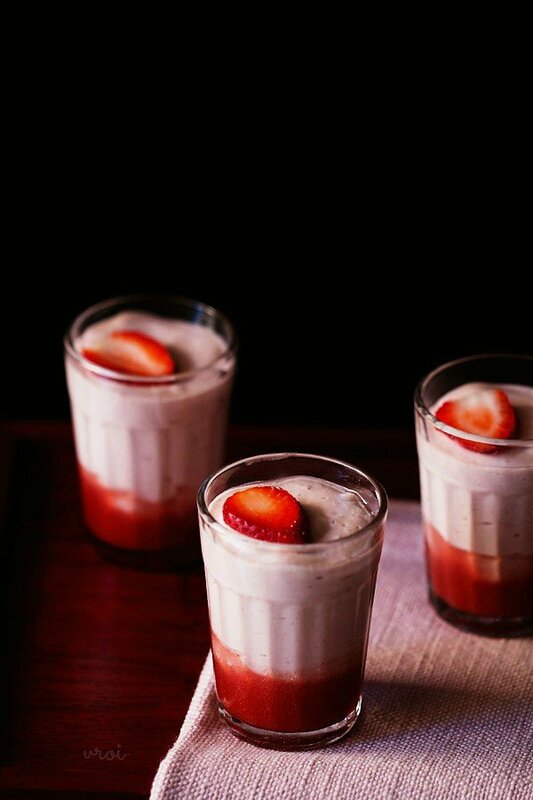 As its holi season, do you think I can add thandai syrup instead of strawberries and the mousse will taste good? 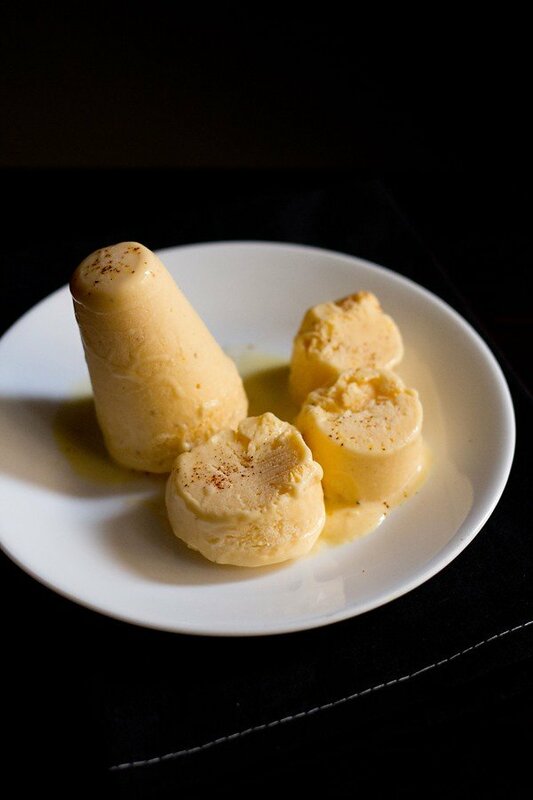 Any thandai mousse recipe that u can help me with. 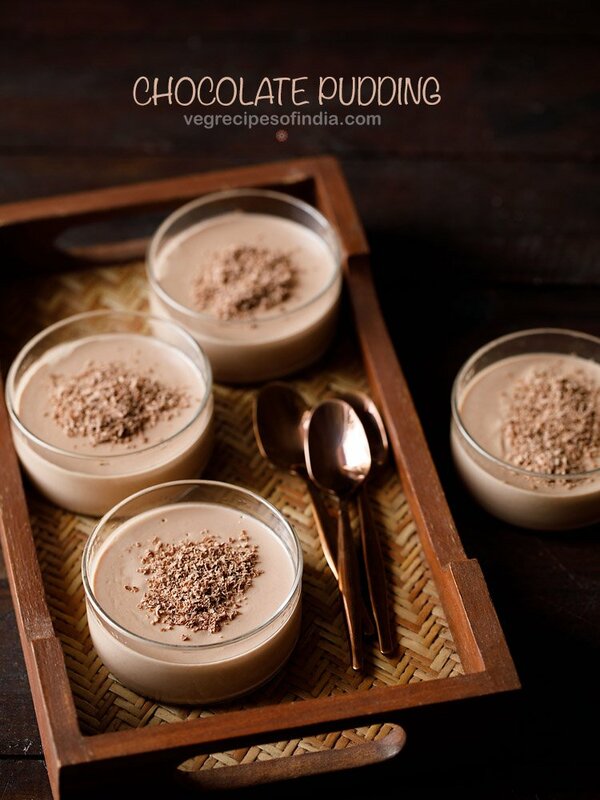 I love ur mousse recipes and the fact that you dont use agar agar or gelatin. ruchi, you can add thandai syrup. just beat the cream very well. it will help to set the mousse well. first whip the cream with powdered sugar. add as required depending on the sweetness of thandai syrup. then add thandai syrup and fold gently with the cream. 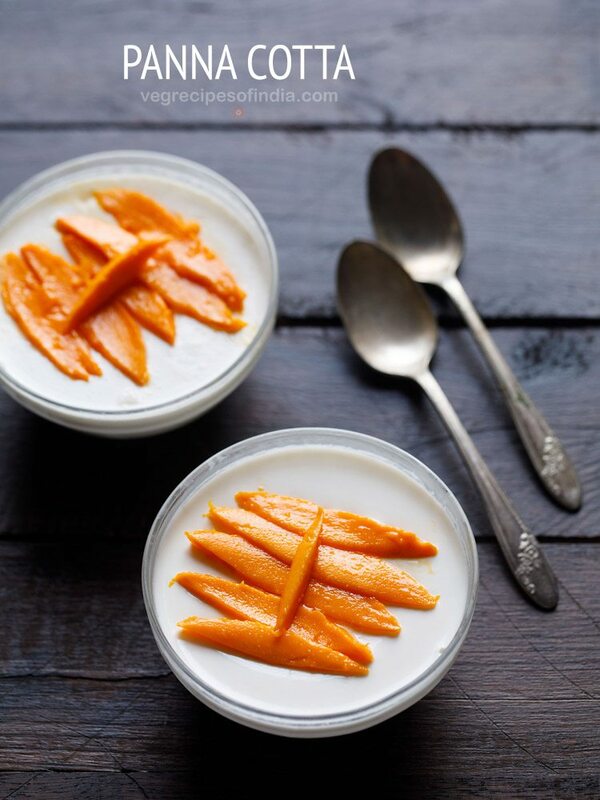 optionally you even add fresh mango pulp as the thickness of mango pulp will help in setting the mousse. but if you beat cream till stiff peaks, then also the mousse will set nicely. By refrigerate do u mean in freezer? I put them in freezer and they became a little hard. welcome ruchi. not in the freezer. just in the fridge. remove from the freezer and keep in the fridge. 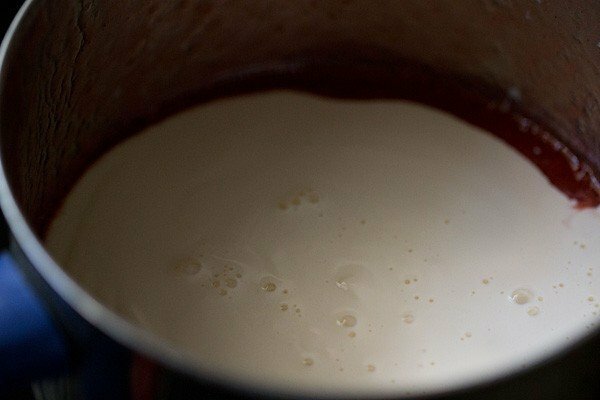 Can i add thandai syrup in the cream to make thandai mousse? Pls suggest. hi pia, till soft peaks. Shall we use strawberry crush instead of real strawberries? 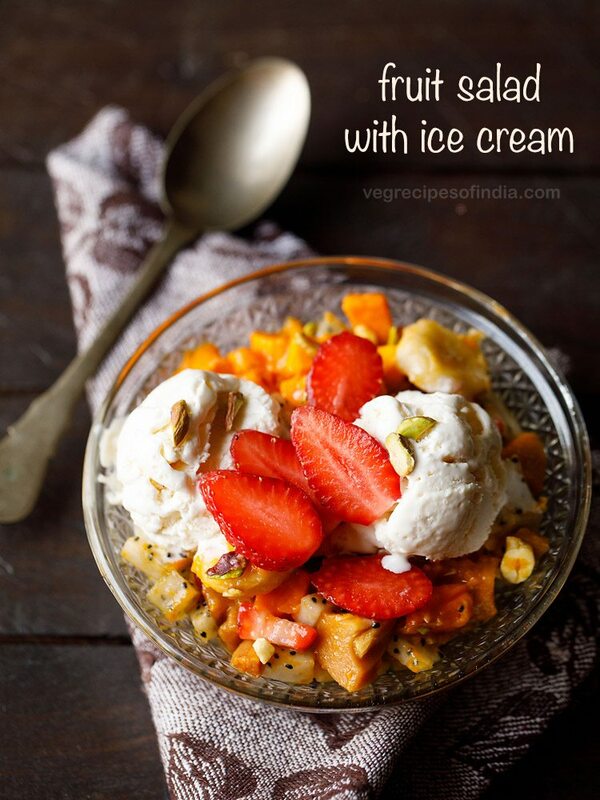 Can I use icecream instand of cream? ranjeeta, i don’t know. never tried this way. Nice my lital girl nexa is say it’s very, very yami . thanks marina. glad to know that you liked the taste of mousse. i think it needs to set. Hi, it dint set .. but tasted awesome … probably i used grinder and not a blender …. marina, in that case may be the cream has got too much beaten or whipped. so some whey must have formed leading to a watery consistency. 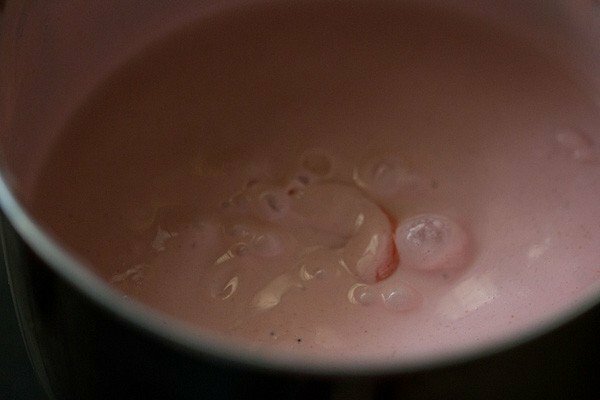 Since I was a child there was always a package or two of instant strawberry mousse in our pantry. I am finally boycotting the packages and starting to make your version with real fruit!! Thank you so much ..
welcome dani. living in india, we never had such instant mousse treats. everything was made at home from scratch. real fruits always taste better than the ready to make and instant mixes. do try this mousse. its tastes damn good. Tried the orange cake today . came out awesome and very soft too!! My MIL was impressed 🙂 thanks for the recipe. welcome nisha. glad to know this. thanks for sharing positive review. I am surely going to try this….after a long time commenting here Dassana :)! anamika, good to see you back. do try, it is very delicious. i have used amul cream only. so you can use it. Hi, do u mean amul fresh cream that we get in India? yes. amul cream that we get in india.